You will be mesmerised by this magnificent Bar Beach residence that will deliver to you and your family a wonderful beach lifestyle via its 5 bedrooms, study/office and multiple living areas spanning approx 500m2 over 3 levels and accessed via an impressive glass lift. Positioned on a beautifully landscaped 460m2 block with solar heated pool and gas heated spa all enjoying that perfect sunny north aspect. Generously offering 3 master bedrooms enhanced by its 3rd level and very opulent main parents retreat bedroom some 75m2 approx in size viewing Empire Park and ocean. A magnificent large kitchen with butlers pantry views open plan lounge, dining, alfresco, pool and rear courtyard. This home is perfect for elderly family members that visit or reside with you or those that require wheelchair access and is ideal for the busy family that does not wish to go through the arduous council approval and building process. Simply just move in and enjoy this potentially once in a lifetime purchase. Inspection strictly by appointment and sure to impress the discerning buyer. * Unique opportunity to secure this impressive home approx 500m2 in size. 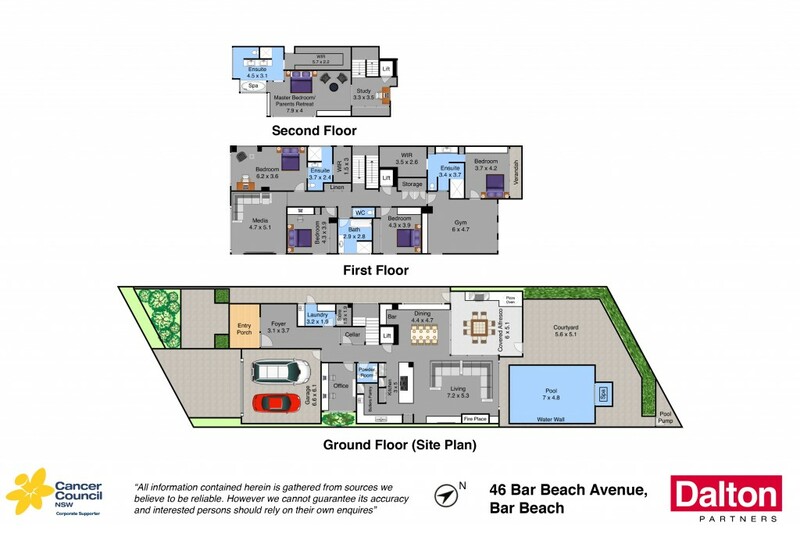 * Luxurious beach living delivered over 3 floors with lift access to all levels. * Generously offering 3 master bedrooms with ensuits and walk in robes. * Opulent main bedroom on 3rd level approx 75m2 in size viewing park and ocean. * Beautiful open plan living area backs north and views solar heated pool and gas heated spa. * Multiple living areas offering projection theatre room and large gym. * Covered alfresco area with integrated BBQ and pizza oven. * An impressive glass cellar plus bar area with 2 Vintec wine fridges. * A magnificent residence with inclusions too numerous to list. * Inspection sure to impress the discerning buyer.